Offering you a complete choice of products which include automatic burglar alarm unit, automatic shutter siren / alarm unit, wireless security alarms unit, automatic wireless gsm shutter alarm unit, audio visual alarm unit and panic alarm system. Material Powder coated Steel Body. Working Temperature -10 to 60 Deg. Cel. Main Control & Display Unit - 1 no. 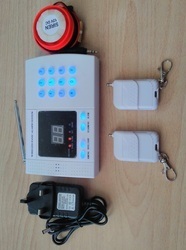 Automatic Wireless Door Sensor - 1 no. Automatic Wireless (Human) Movement Sensor - 1 no. Wireless Remote control Key - 1 no. 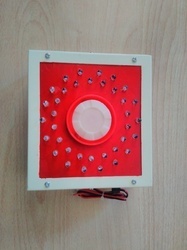 Electronic Alarm Siren - 1 no. 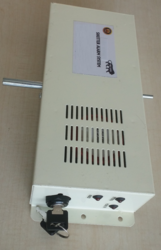 AC Adapter (230VAC/12VDC) - 1 no. Silent Monitor, Nonstop surveillance, instant reaction & response. Sences any type of unwanted infiltration/movement/ activity; even in dark. Small and Sleek Shape. Not generally noticeable by intruders/infiltrators. Instantly sounds alarmed; sends call/SMS to your mobile/landline phones. Hassle free, plug in set up; Easy to use. Built-in backup rechargeable battery to keep working after power off. Delivery Time: Immediately on payment receipt. Packaging Details: Corrugated Carton Box. Dimension 260mm (L), 160mm (W) and 60mm (H). 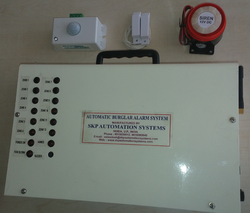 This Shutter Alarm/Siren unit is a typically designed tailor-made safety device for the total protection of unauthorized entry into your shops, warehouse etc. by breaking open the shutter, even by few inches. It gives Loud Hooting sound. Theft, loot, robbery and riots into the Shops, Showrooms, Banks, ATMs and warehouses by breaking/ opening the Shutter is very commonly seen nowadays. Only depending on one or two the security guards is not adequate. That is why we have come up with this solution. It is a sure & subtle solution of illegal entry to anyone in your premises. 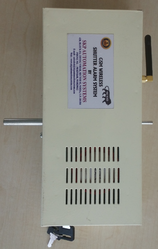 This unit is self-powered & does not require any external wire connection for activation. If any person wants to enter in your premises in the wrong intention, he/she will have to lift the shutter at least by 1 feet. It makes impossible for thieves to flee uncaught. Secondly, once the unit starts hooting sound, it cannot be stopped by any means except the given Key. Alert up to 3 mobile number via Call. Easily replaceable readily available 9V Battery. In the normal course, batteries run more than one month. Low battery warning LED indicates the requirement of battery replacement. Once it finds the illegal entry (in case shutter is opened even by few inches) after 10-20 seconds, it starts sounding hooter & keeps on sending a phone call to the pre-set phone numbers one by one. Then after it can only be stopped by unlocking/resetting the unit by given Key. Fully reliable & field-proven design. Zero maintenance, Shock proof, Weatherproof, sturdy & Standalone unit. Working Temperature -10~+60 Deg. Cel. We have come up with a unique solution for Automatic non-stop unmanned surveillance of all your valuables. Be it a locker Room of Bank, ATM Room, Jewellery Shop, Jewellery Factory, Data Warehouse even your house, we are there to protect your valuable resources with our solutions. AC Adopter (230VAC/12VDC) - 1 no. Microprocessor based, Realtime response. 4 Senses any type of unwanted infiltration/movement/ activity; even in dark. Instantly sounds alarmed; sends call. Usage For any alarm raising with any Switch(MCPs) or Panels(Alarm Panels) in any Industry / Organisation. 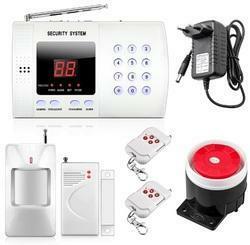 With wonderful specialization in this field, we offer a qualitative variety of Panic Alarm System. These products are designed by making use of superior-grade material; the offered products are highly demanded by our patrons for its incomparable quality. In addition to this, our valuable Panic Alarm System can buy this bag at budget-friendly rates from us along with different stipulations. Microprocessor based, Digital GSM Technology. To raise alarm, Just need to press the SOS button on Wristband, it will call all the phone numbers (5 max.) those you present in it. Similarly, on raising alarm, it can send SMS to all the phone numbers (5 max.) those you pre-set in it. SMS alert for power failure or recovery breaking activities. Looking for Industrial Alarm Units ?